Reading and share top 5 famous quotes and sayings about Message In A Bottle by famous authors and people. 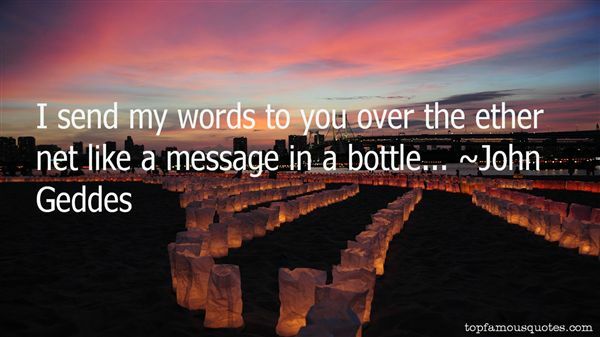 Browse top 5 famous quotes and sayings about Message In A Bottle by most favorite authors. 1. 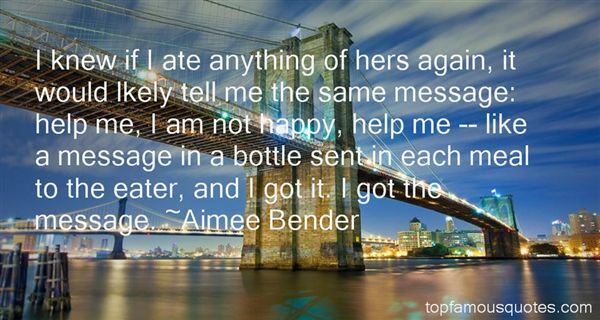 "I knew if I ate anything of hers again, it would lkely tell me the same message: help me, I am not happy, help me -- like a message in a bottle sent in each meal to the eater, and I got it. I got the message." 2. "I think every work of art is an act of faith, or we wouldn't bother to do it. It is a message in a bottle, a shout in the dark. It's saying, 'I'm here and I believe that you are somewhere and that you will answer if necessary across time, not necessarily in my lifetime." 3. "I send my words to you over the ether net like a message in a bottle..."
4. "Do you want Columbus to go across the ocean, or do you want to put a message in a bottle and hope that it lands somewhere? I'd rather have actual people be there. Whether they look like Americans or like the inhabitants of some other country, depends on who has the most drive." 5. "A poem, as a manifestation of language and thus essentially dialogue, can be a message in a bottle, sent out in the –not always greatly hopeful-belief that somewhere and sometime it could wash up on land, on heartland perhaps. Poems in this sense too are under way: they are making toward something. Toward what? Toward something standing open, occupiable, perhaps toward an addressable Thou, toward an addressable reality." When you are a strong woman, you will attract trouble. When a man feels threatened, there is always trouble."